Of Science And Faith, As Discussed By A Physicist And A Cardinal : 13.7: Cosmos And Culture The essence of a constructive dialogue between faith and science is to recognize that we are all in this together — and that our perplexity at being alive is one and the same, says Marcelo Gleiser. 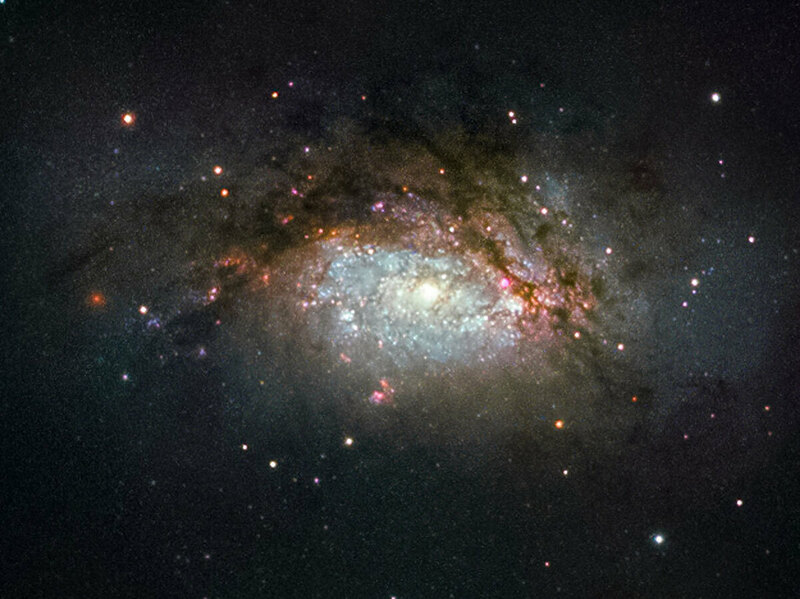 NGC 3597, seen in this Hubble Space Telescope image, is the product of a collision between two good-sized galaxies, and is slowly evolving to become a giant elliptical galaxy. Many of my non-believer colleagues would think it foolish to step onto a stage with a high-ranking Vatican cardinal to discuss science and religion. They would claim it to be a waste of time, and the more extreme ones would say that doing this gives religion a credibility it doesn't deserve. Given that I strongly disagree with this sort of radicalized scientism, this past Monday I shared a stage in Curitiba, a large city in Southern Brazil, with Cardinal Gianfranco Ravasi, the president of the Pontifical Council for Culture. It was a memorable and inspiring event. Ravasi stands out for his open embrace of science. He is earnestly seeking connections with leading scientists around the world to discuss questions of great importance to society as a whole, from stem cell research to whether one can be moral without religion, to our relentless march toward transhumanism. To establish a public open forum for these discussions, Ravasi followed Pope Benedict's directive to create the itinerant Court of the Gentiles, to foster constructive dialogue between Christian believers and agnostics and atheists, addressing questions of "faith and reason, secular culture and the Church." I opened the night explaining how science amplifies our view of reality, creating an ever-growing narrative of the natural world; how it has changed our worldview several times in the past and how it will continue to do so in the future, as we probe deeper and farther recesses of the material world. I quoted Einstein, and his urging us to engage with the "Mystery," the same source of wonder that fuels scientific and artistic creativity. There is a spiritual dimension to the scientific process, I said, as it brings us closer to nature. Einstein would mention Spinoza's God, all-pervasive nature, others simply share the awe of asking big questions about the world we live in. It is asking the questions that make us matter — and the essential questions have been the same for millennia: How do we explain the origin of the world, of life, of us? How do we find meaning in a cold universe? How do we know we are free to choose our destiny? I argued that modern science, in exploring the diversity of worlds out there and the difficult steps for life to evolve from simple prokaryotic cells to full-thinking humans make it highly unlikely that there will be many intelligent aliens in our galaxy. This has important consequences, given that we become this rare oddity, molecular machines capable of self-awareness. In a metaphorical sense, science is restituting our cosmic importance as guardians of thought and of life, at least in this planet. Believers make up at least two-thirds of the world's population. To simply deny their faith as pointless under some sort of militant rationalism goes nowhere. Ravasi dismisses the radical pronouncements of some non-believers, hoping instead for an open exchange of ideas. At some point, he said that there are three (metaphorical) ways to look at the world: down at the material under our feet, forward to other humans, and up in search of some sort of transcendence. We need all three. He rarely mentioned God, and was more interested in offering a pluralist approach to knowledge. He did mention Stephen Jay Gould's Non-Overlapping Magisteria (NOMA) thesis that science and religion should coexist without interference, like two parallel lines. He praised Gould for at least placing religion on an equal footing in science as a possible magisterium, but suggested that we must go beyond this to create a more cohesive way to think about the two. He joked that in Galileo's time, such kind of dialogue between faith and science would be unthinkable. In that time, the prelates would be the ones refusing to share the stage with a mere scientist. "Times have changed," he said, "and we must change with them." He seemed perfectly sincere and authentic. It was refreshing to see that the Vatican has people like Ravasi in such high-ranking posts. He seems ready to write a new chapter, a good one this time, in the long and often tortuous history between the Catholic Church and science. Throughout the night, it was clear that the point of these dialogues is not to change the other's mind. That would be a fruitless exercise, as history has taught us over and over. The point is to have an open mind about what the other is thinking, without resorting to some kind of primitive tribalism where the "other," the one with different opinions or values from you, is necessarily your inferior. It was also clear that a dialogue of any kind would be impossible between radicalized factions. I wouldn't sit down with a literalist or with my orthodox Jewish cousin to discuss science and faith. A literalist's arguments would be pointless to most scientists. We live, however, in an age where the word "spirituality" is being rescued from its religious usage and being given new wings. Humans are spiritual beings, yearning for some sort of self-transcendence. To some it may be God, to others it may be through meditation, to others it may be through art and science, and to others through a trail run on a remote mountain. All of these share an element of timelessness that we crave. William James has made the point that the essence of the religious experience is deeply personal and subjective. We are finite creatures with more questions than answers living for a finite time in a complex web of facts, people and values. The essence of a constructive dialogue between faith and science is to recognize that in our separate ways we are all in this together. And that our perplexity at being alive is one and the same, even if expressed in such different ways.